As a soloist, Mr. Díaz collaborates with leading conductors of our time on stages throughout North and South America, Europe, and Asia. He has also worked directly with important 20th- and 21st-century composers, including Krzysztof Penderecki, whose viola concerto he has performed many times with the composer on the podium and whose double concerto he premiered in the United States; and Edison Denisov who invited Mr. Díaz to Moscow to work on his viola concerto. 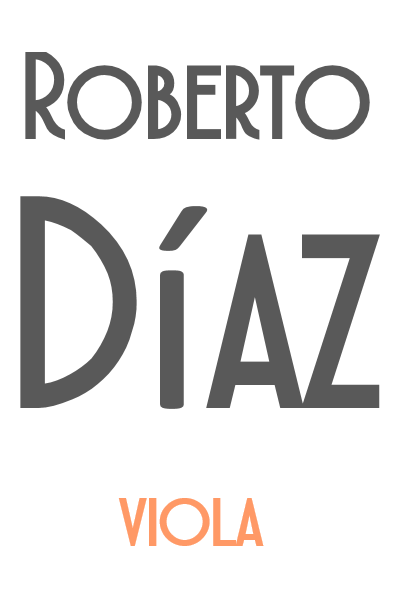 Ricardo Lorenz, Roberto Sierra, and Jennifer Higdon have all written concerti for Mr. Díaz. As a frequent recitalist, Mr. Díaz enjoys collaborating with young pianists, bringing a fresh approach to the repertoire and providing invaluable opportunities to artists at the beginnings of their careers. In addition to performing with major string quartets and pianists in chamber music series and festivals worldwide, Mr. Díaz has toured Europe, Asia, and the Americas a member of the Díaz Trio with violinist Andrés Cárdenes and cellist Andrés Díaz. The Díaz Trio has recorded for the Artek and Dorian labels. Mr. Díaz's recordings on the Naxos label with pianist Robert Koenig include the complete works for viola and piano by Henri Vieuxtemps and a Grammy-nominated disc of viola transcriptions by William Primrose. Also on Naxos are Brahms sonatas with Jeremy Denk and Jonathan Leshnoff's Double Concerto with violinist Charles Wetherbee and the Iris Chamber Orchestra led by Michael Stern. On the New World Records label is a live recording of Mr. Díaz's performance of Jacob Druckman's Viola Concerto with Wolfgang Sawallisch and the Philadelphia Orchestra. On the Nimbus label is a recording of the Walton Viola Concerto with the New Haven Symphony and William Boughton. On the Bridge Records label are works for viola and orchestra by Peter Lieberson with the Odense Symphony Orchestra and Scott Yoo. Since founding Curtis on Tour eight seasons ago, Mr. Díaz has taken the hugely successful program to North and South America, Europe and Asia, performing chamber music side-by-side with Curtis students and other faculty and alumni of the school. His tenure as president of Curtis has also seen the construction of a significant new building which doubled the size of the school's campus; the introduction of a classical guitar department and new conducting and string quartet programs; the launch of Curtis Summerfest, summer courses open to the public; and the debut of an online stage called Curtis Performs. In the fall of 2013 Curtis became the first classical music conservatory to offer free online classes through Coursera. Also under Mr. Díaz’s leadership, Curtis has developed lasting collaborations with other music and arts institutions in Philadelphia and throughout the world and established a dynamic social entrepreneurship curriculum, supported by a prestigious Advancement Grant from The Pew Center for Arts and Heritage. Designed to develop the entrepreneurial and advocacy skills of young musicians, this curriculum includes the project-based Community Artist Program (CAP) and post-graduate Curtis ArtistYear Fellowship Program. Curtis was the first higher-education arts institution to join ArtistYear and respond to the challenge issued by the Aspen Institute’s Franklin Project: to foster a 21st-century national service system, with a goal of one million service-year positions created by 2023. Mr. Díaz received an honorary doctorate from Bowdoin College and was awarded an honorary membership by the National Board of the American Viola Society. In 2013 Mr. Díaz became a member of the prestigious American Philosophical Society founded by Benjamin Franklin. As a member of the Philadelphia Orchestra, he was selected by Music Director Christoph Eschenbach to receive the C. Hartman Kuhn Award, given annually to "the member of the Philadelphia Orchestra who has shown ability and enterprise of such character as to enhance the standards and the reputation of the Philadelphia Orchestra." Mr. Díaz received a bachelor's degree from the New England Conservatory of Music where he studied with Burton Fine, and a diploma from the Curtis Institute of Music where his teacher was his predecessor at the Philadelphia Orchestra, Joseph de Pasquale. Mr. Díaz also has a degree in industrial design. 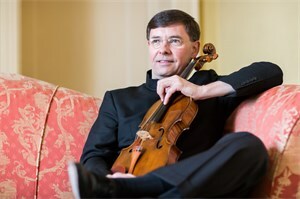 In addition to his decade-long tenure as principal viola of the Philadelphia Orchestra, where he performed the entire standard viola concerto repertoire and gave a number of Philadelphia Orchestra premieres, Mr. Díaz was principal viola of the National Symphony under Mstislav Rostropovich, a member of the Boston Symphony under Seiji Ozawa, and a member of the Minnesota Orchestra under Sir Neville Marriner. Mr. Díaz plays the ex-Primrose Amati viola.